KARACHI: Pakistan has put under the hammer 102 luxury vehicles, including seven bullet-proof cars used by the Prime Minister House on Monday. Prime Minister Imran Khan had announced the auctioning of the luxury vehicles as part of his austerity drive of jettisoning extra financial burden on the national exchequer. The vehicles included eight BMWs, 28 Mercedes cars, 40 Toyotas, five Mitsubishis, two Land Cruisers, and two jeeps. The models of the vehicles ranged from 1994 to 2016. The public response was overwhelming: Within the first few hours of the auction some 10 vehicles had sold, given the government’s condition that the successful bidder would have to submit all taxes while 10 percent of the price and remaining payments would be made within seven days. “So far 70 vehicles have been auctioned at higher prices,” Information Minister Fawad Chaudhry announced at a news conference Monday evening. The process will continue till late night. 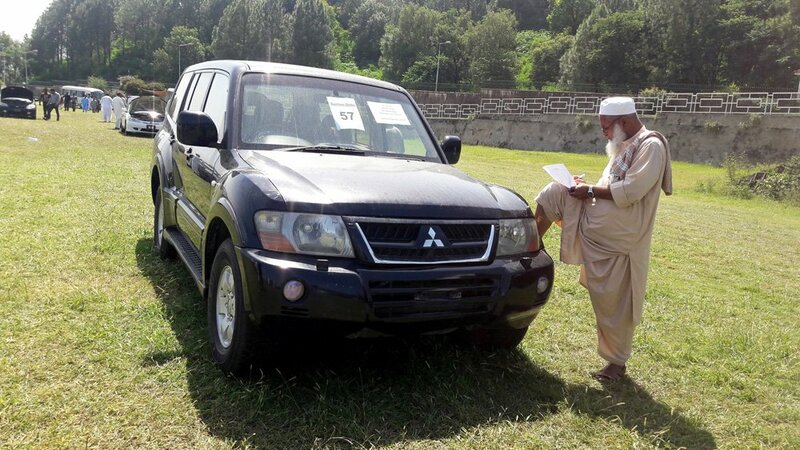 During the auction, four bullet-proof Mercedes jeeps were auctioned for the prices ranging between PKR9.38 million ($75,779), and PKR14.5 million. “Some vehicles could not be auctioned yet due to high duty and taxes levied on them. However, duties and taxes of such vehicles will be reviewed,” said Major Asif, administrator of the PM House. “Though the auction of these vehicles is not the only solution to the country’s economic problems, it is the first step as this is expected to be followed by many similar gestures,” the senior economist Professor Dr. Athar Ahmed told Arab News. Ahmed believes that the auction of the luxury vehicles is a message to the bureaucracy and the future government that the austerity is the only way out of chronic economic ills. “We understand that this move is just the act of transfer of assets but it leaves a strong message,” he added. Pakistan, which depends on foreign assistance and loans to a large extent, is known for its officials’ high expenditures and ruthless use of state machinery for their own good. The presence of luxury vehicles is the prime example. “When we seek loans from other countries and invite them to our palaces, their impressions are always adverse,” said Abdul Qadir Memon, senior lawyer and president of the Pakistan Tax Bar Association. As the government is pushing hard to rely less on foreign aid, the stakeholders call for legal action against the misuse of public money. “The government should take a bold step by banning the imports of luxury items, including super luxury vehicles,” Ahmed said. The austerity move of Prime Minister Imran Khan’s government aims to reduce dependency on foreign loans and financial assistance. The country immediately needs up to $9 billion to meet its international payment obligations and stabilize its balance of payments sheet.